Daniel Waugh sent in the following eight photographs taken between 1995 and 2009. Since they are all related to his travels in the Xinjiang region and thence down into India, I have decided to treat them as a set. 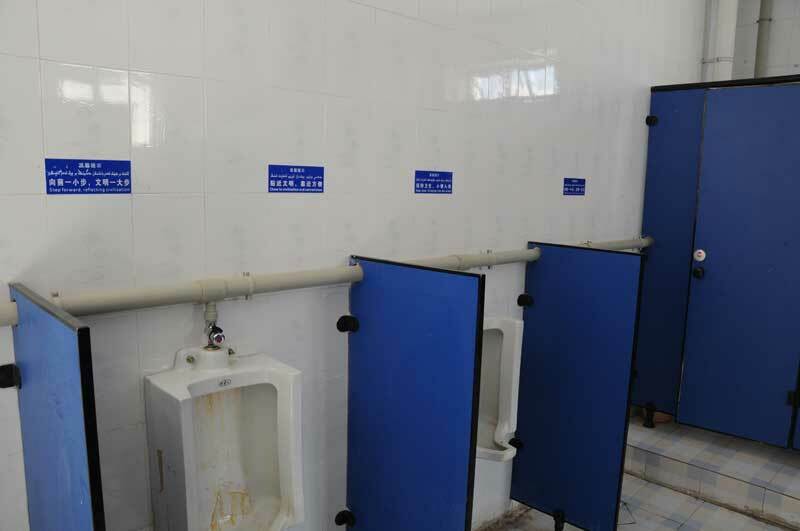 The first three are from a men's room at the Gez checkpoint on the Karakorum Highway (KKH) south of Kashgar. 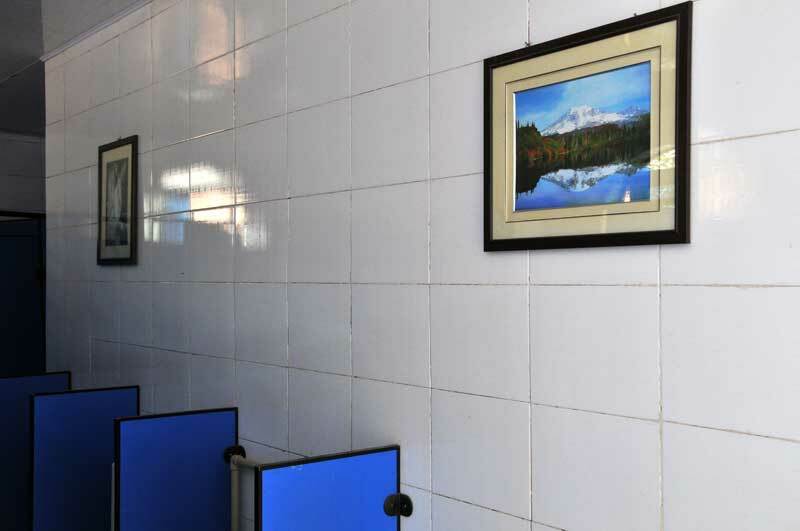 Also, for decor above urinals, see the one at the end of the batch (this one at the Ai cave site), with a photograph of Mt. Rainier (but no signs as to where to point what you are doing…). 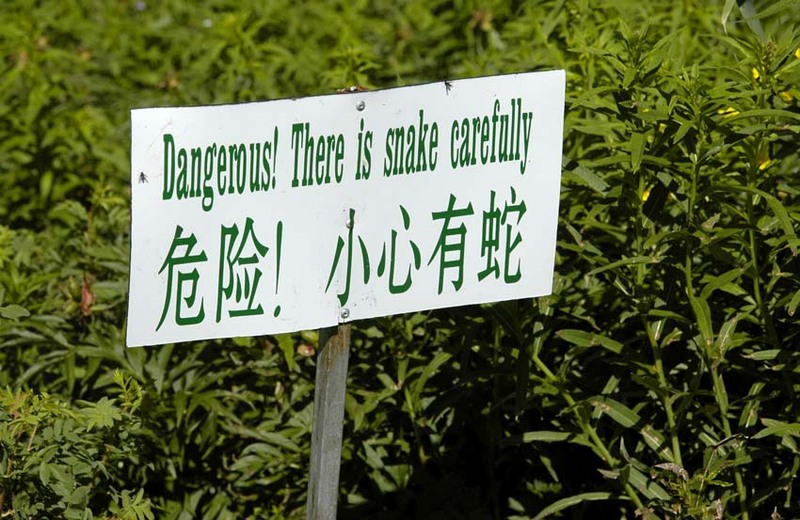 The snake warning sign is along the path above Lake Kanas in the northern tip of Xinjiang. I think its real intent was to keep people from trampling the not so wild (they apparently have been planted) wild flowers. The last couple are not so much for linguistic analysis, though I think the "marriage reassembling" is an interesting concept. That one was taken in Delhi. 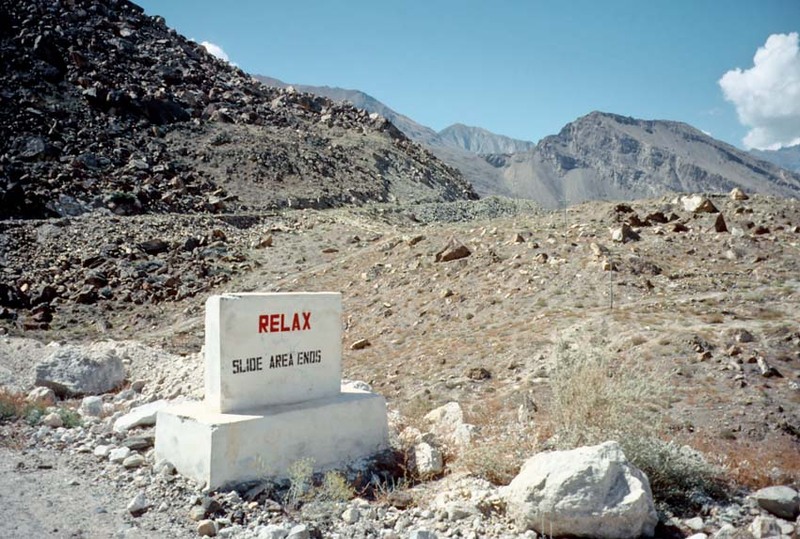 The "relax" sign is in one of those precipitous stretches of the KKH above the Hunza Valley just before you get to Karimabad (Baltit). I was riding a mountain bike along that stretch of the road. "Linguistic Advice in the Lavatory: Speaking Mandarin is a great convenience for everyone"
"Remembering Neil Armstrong and his 'one small step'"
"Armstrong's abbreviated article: notes from the expert"
"Your having stepped one small step forward, [copula] your having taken one big step in civilization"
"Being civilized, standing closer do taharät (going to the bathroom)"
The first one does have parallel structure in both halves, but is very long and clunky and unnatural sounding. It seems to me to be secondary to the Chinese. Also, taking a big step IN civilization makes less sense than mädäniylikkä, towards civilization. Mädäniylik is literally "civilizedness." I think a more natural sounding phrasing would have something like basqisingiz, "if you step…" But to my ear this is one of those ideas that would be phrased in completely different ways depending on the language, and it does look like the Uyghur is trying to be a direct translation from the Chinese. The similarity between mädäniy and 文明 is interesting. The Arabic root connotes urban, urbanized, civilized, polished, refined (and now secular, civil) and is the root of madīnah, city. So the extension of meaning to being cleanly in public is not as distant from its original as that of wenming, the 'brightness of literary culture.' An alternative word to mädäniy doesn't jump out at me, though, and maybe that is the most natural sounding word for the idea of being respectfully cleanly. The second sign doesn't try for symmetry but just gets to the point: be civilized, stand closer, and do your business. "Zebra crossing" may sound strange to American ears; we usually just refer to that area of an intersection as a "pedestrian crossing". Danger! Be careful of snakes. The other photographs speak for themselves. Compare the fourth one with this warning, from an "Expat Guide" to Moscow published in 2000. "Whatever you do, do not assume that you can expect cars to stop if you are crossing on a zebra-crossing. Cars do not stop for pedestrians at zebra-crossing!" Perhaps neo-Confucianist rhetoric about "harmony of human and vehicle" is not consonant with the culture of post-Soviet Russia. 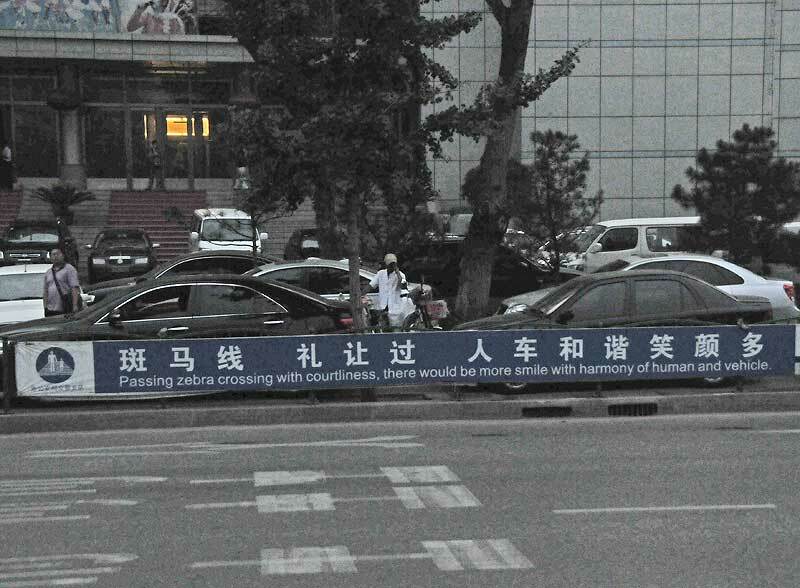 "Zebra crossing" is of course a reasonably standard BrEng term – I suppose it may be interesting to see if there's any pattern when PRC translations use BrEng terms typically not used in AmEng, and when they use AmEng terms typically not used in BrEng. @ J. W. Brewer: The standardness of "zebra crossing" surely has to do with whether pedestrian crossings are marked by multiple thick stripes parallel to traffic (as in China and Europe) or by two narrower lines orthogonal to it (as is typical in the USA). While it's still an uncommon term here (Minnesota), I've heard zebra crossing on occasion recently (as more crosswalks get the diagonal stripes) – going from 'standard' or 'solid' as was previously the norm, to 'zebra', according to this chart. I'm seeing the "continental" pattern (see Jake's chart) increasingly in my part of the US, but my impression is that Brits would still call that a zebra crossing. Am I wrong? I agree that the term is starting to develop a little currency here. If google translate is accurately telling me that the first two simplified hanzi (from the left) in that sign are the Mandarin rendering of "zebra," than that suggests to me that the Mandarin phrase is a calque from BrEng or some other western language using the zebra metaphor, so translating it back the same way makes eminent sense. One could adopt the "zebra" style of paint-on-the-pavement without using a zebra-related name for it in your own language, of course. I don't know about Brits, but to me that definitely is a zebra path (Dutch) or zebra stripes (German), while I don't think I've ever seen a ladder or a crooked ladder. I suppose that might be why they call it continental; however, the world's most famous zebra crossing looks exactly the same. I think we can safely assume that (American) crosswalk jargon has defined these terms either differently or more precisely. Bruce Rusk: We have both types here in DC. I judge that drivers are marginally more likely to stop for pedestrians in the European-style ones, because they're less common and (therefore?) more "important", though the law requires drivers to stop for both. So, when unfamiliar with the BrEng definition, the joke in The Hitchhiker's Guide to the Galaxy about some philosophers getting killed at a Zebra Crossing after declaring black equal to white inspires an interesting image. I live in Australia. When I was young, the term 'zebra crossing' was common. I haven't heard the term for some time, maybe because I now live in a major city and almost all of the pedestrian crossings are controlled by lights. There are some non-lighted pedestrian crossings in the main street of my suburb, but I can't remember ever hearing anyone call it by any particular name. I have never seen the slanted-line zebra crossing, as on Jake's chart. Some of my students from various countries express great surprise and admiration that drivers stop at traffic lights, let alone non-lighted pedestrian crossings. A zebra crossing is just a marked place to cross without traffic lights. In the UK, jaywalking does not exist. People cross the road anywhere and are only honked by cars if the car has to brake suddenly to avoid hitting them. In Hong Kong I have always referred to them as 斑马线 and zebra crossings without thinking about which language the term came from first. Also, I don't understand why officials feels the need to run every Chinese sign through Baidu Translate to produce an English-looking output. Few people know English in those areas and those who do probably know Chinese anyway, or are coming to learn (less so in Xinjiang I suppose) and don't want English. It would be far more useful to provide a Pinyin transliteration. "I don't understand why officials feels the need to run every Chinese sign through Baidu Translate to produce an English-looking output"
AFAICT they're not English speakers at all (or that concern is _very_ far down the list). Signs in English are currently kind of pseudo-religious talisman in much of the world, reassuring the local population that they're not being left behind in a modernizing and globalizing world. Their presence is enough to do that and so the content doesn't much matter to the primary intended recipients. "It would be far more useful to provide a Pinyin transliteration." Since when have Chinese officials concerned themselves with ideas like 'useful'? The English signs in China are for international tourists who do not know any Chinese but usually do know English. The UK pedestrian crossing markings are detailed in the Traffic Signs Manual: Chapter 5 (Road Markings). Starting on Page 90 (marked as page 88) with a diagram on the next page. Pedestrian crossings in general are marked by two rows of studs, although they're optional (but still fairly common) on zebra crossings. The document above says they can be square or circular, but I can't recall ever seeing circular ones. I find the sign itself more interesting. It would be nice to see the context. In particular in the UK I'd assume that it was aimed at motorists (who are generally assumed to be capable of taking a greater share of the responsibility as they're adults), placed across a T-junction so they could see it and erected as part of a temporary campaign by the department of transport or a concerned group. Would all that hold true in china as well? In Paris, pedestrian crossings are marked by two rows of circular studs ("les clous", literally 'the nails'). This applies to streets which are actually "paved" (with paving stones). The studs are inserted between the stones. I think that on tar-and-gravel pavements there are painted lines. There were no such thing in Mandarin as 斑馬線/斑马线 at first.Even 线 is reduced from 綫[thread]. 線= line. Even though, today both words in Chinese are pronounced the same whether in Mandarin or Cantonese, etc…, they were not the same word. One = thread, the other = line. 斑马线 didn't exist in China. They took the word from Hong Kong Chinese of 斑馬線, which translated from British English "zebra crossings". In the USA, they are almost always called "crosswalks" or sometimes "pedestrian crossings". Rarely is it ever called "zebra crossings". A page on Baidu says "繁体：线"
which is totally wrong! In 繁體, it's 綫, not 线, which is the Simplified version. Now in Hong Kong Cantonese, both 綫 & 線 are pronounced the same and mean the same. Only context is used to distinguish the meaning of whether "thread" or "line" is meant. According to Wikipedia Hong Kong now uses "Tiger Crossings" with yellow and black stripes. It sounds inherently more Chinese, and this variant originated in Hong Kong, but the idea of animal imagery has clearly been adopted from UK English. The Tiger is being experimentally introduced into the UK (like most introduced species here it will probably soon be rife!). We already have Pelicans, Puffins, Toucans and the mythological Pegasus crossing. Sadly the Panda crossing became extinct in 1967. There is a Visitor Center there that charges a fairly hefty admission fee. They have the only toilet facilities for miles around. On the other hand, if you wanted to hike out to Chimney Rock (a few miles from the parking lot), there is nothing to stop you walking around the Visitor Center and hiking on out, or for that matter, stopping behind a convenient bush to make your own toilet facilities, pioneer-style. On the same trip we visited several other Oregon Trail sites, all of which were free, and none of which had any signs about rattlesnakes. Although I am well aware that rattlesnakes are quite common all over the western US. And given that they are considerate enough to give you a warning to back off, they must be among the least dangerous poisonous snakes you would run into. I have encountered rattlesnakes several times while hiking, and it was never a big problem. In the picture shared by maidhc, the German, French, Spanish, and Japanese versions all just say "poisonous snake", not "rattlesnake". I wonder if they all have a special word for "rattlesnake" that could have been used. "all just say "poisonous snake""
According to wikipedia, however, there are a few poisonous snakes, but they seem to be that way from a diet of poisonous animals rather than producing poison themselves. Back on topic, looking around wikipedias German, French and Japanese all have words for rattlesnake. Maybe they're thinking lawsuits and thinking someone who got bit might claim they didn't realize rattlesnakes were venomous….. The translators for Chimney Rock were probably making reasonable assumptions about their readers. Would their readers of English be quicker to recognize "rattlesnake" or "poisonous snake"? How about their readers of German, French, or Japanese, unfamiliar with English? Of course a hundred years ago German was pretty common around there. It's kind of like "Spanish is a phonetic language" or "English has no grammar" or talking about the 'short' i in bit and 'long' in bite. They drive specialists up the wall and wouldn't be used by them but still part of normal usage and understandable to the people who say them. Regarding the "marriage reassembling" sign in New Delhi: Hindu marriages involve a 'baraat' which is a procession of the bridegroom on a mare accompanied by friends and relatives on foot, led by a raucous band playing film songs, boys carrying lights, etc. The baraat departs from the bridegroom's home and ends up at the bride's home where the ceremonies take place. In a big city, it is impossible for the baraat to walk all the way. So they get into buses, reach a designated assembly (or, correctly, reassembly) point near the bride's home, maybe have some snacks or drinks, and then walk down to her place. 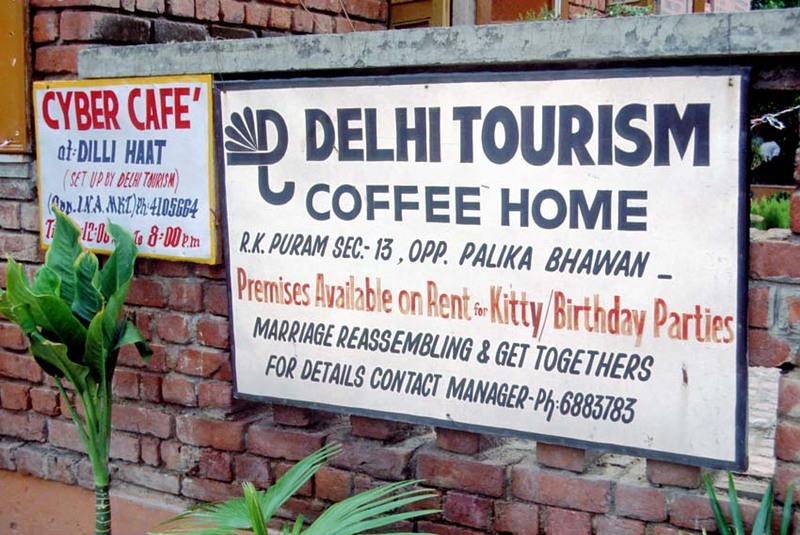 The Coffee Home had spacious premises and so it was offering these services. Kitty for “kiddie” is not unknown orthography/eggcorn (?) in the U.S. either, where intervocalic T becomes an alveolar flap, rendering e.g. ladder and latter homophonous in most varieties. the joke in The Hitchhiker's Guide to the Galaxy about some philosophers getting killed at a Zebra Crossing after declaring black equal to white inspires an interesting image. That passage of the book also required a great deal of processing and rereading for this Am.E. speaker, who finally, after much analysis and internal debate (this was pre-Web days), decided a “zebra crossing” must be what they call a crosswalk in Br.E. (and not a stretch of road where zebras are likely to be in your path, as, to my knowledge, they are rare in rural England, and seeing their black stripes as white or vice versa wouldn't seem to engender a fatal miscalculation). Eric, kitty is not an odd orthographic choice for kiddy here. It refers to parties that women, usually upper middle-class housewives organise, by contributing a fixed amount towards a communal "kitty" and using that money to finance regular parties. See wikipedia for instance.